After the controversy and contention dies down, the business of baseball settles the player-umpire dynamic in one of a few ways, including cordiality and respect. 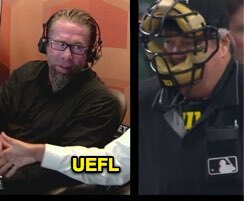 For an example, we turn to Hall of Fame Astros legend Jeff Bagwell and MLB veteran Joe West. Yes, sometimes grudges rule the day and for that, see the following post, but this brief blurb is about a positive outcome. Related Post: Let's Talk - Mental Health in an Abusive Environment (10/10/17). This one's a quick story, with Bagwell visiting the Astros booth as part of Astros Legends Weekend at Minute Maid Park, coincidentally with West serving as Saturday evening's home plate umpire. Bagwell, who was never ejected in his 2,150-game Hall of Fame career, told an anecdote or two of his time playing in front of West (and his proprietary West Vest), surmising in the end that, "Joe's a great umpire. If I had a big game, honestly, I'd want Joe behind the plate. I think he's very fair, consistent, and does a great job." For reference, The Hardball Times named West the most consistent umpire in baseball in a 2007 study.